At the State Fair of Texas this week, Chevrolet presented four concepts of its freshly redesigned, 2019 Chevrolet Silverado 1500 pickup truck in order to promote its collection of customizing accessories. 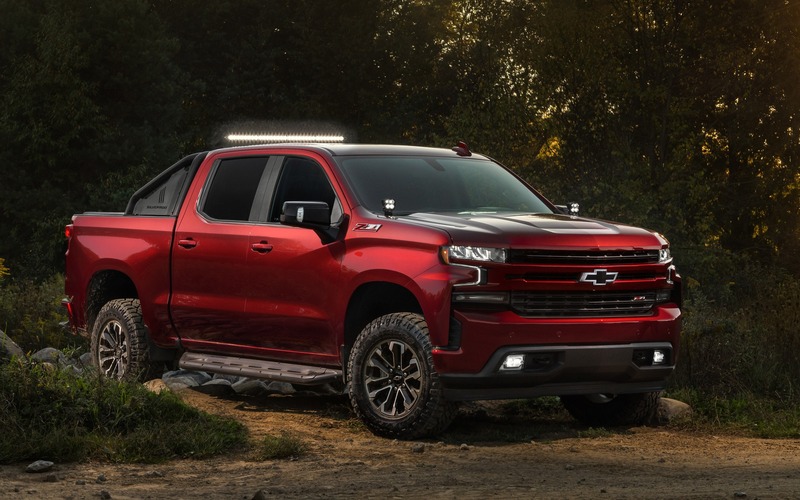 The manufacturer introduced the Silverado High Country Concept, the Silverado LTZ Concept, the Silverado RST Offroad Concept and the Silverado RST Street Concept, four trucks packed with accessories and parts available at GM dealerships. Vehicle customizing with factory parts is gaining in popularity, and with so many pickup trucks sold each year, we can’t blame buyers for wanting to add a little uniqueness to their vehicle. The Silverado High Country Concept presents the idea of a more luxurious truck for the adventurous type, with a two-inch suspension lift kit as well as a bronze-coloured grille and 22-inch alloy wheels. Brembo front brakes with six-piston callipers, an Advantage retractable cargo cover, a dual exhaust system and a cold-air intake system for the 6.2-litre V8 have also been added. The Silverado LTZ Concept was built to demonstrate the truck’s towing capabilities in addition to performance parts available for the 5.3-litre V8. The pickup is equipped with a Z71 suspension, but also a performance exhaust system, Brembo front brakes with six-piston callipers, 22-inch chromed alloy wheels, an illuminated grille Bowtie logo, chromed assist steps and an Advantage retractable bed cover. The LTZ Concept also includes a removable camera that can be attached to a trailer, whose projection is displayed in the centre stack infotainment screen. The Silverado RST Offroad Concept gets a monochrome and sporty appearance mixed with an off-road package. It includes a two-inch suspension lift kit, a sport bar, Baja Designs LED auxiliary lighting, black 18-inch alloy wheels with all-terrain tires, an illuminated grille Bowtie logo, black trim, assist steps and a roll-up bed cover. Last but not least, the Silverado RST Street Concept boasts a more aggressive appearance with a lowered suspension, bodyside graphics, carbon fibre-style trim, Brembo front brakes with six-piston callipers, glossy black 22-inch wheels and an UnderCover rigid bed cover. Its 5.3-litre V8 has also been massaged with a Borla dual exhaust system and a cold-air intake system. The four concept pickup trucks will also be on display at the SEMA show next month.